We offer a large variety of bulk, Generic Tablet Medication that covers a wide range of injuries and illness. 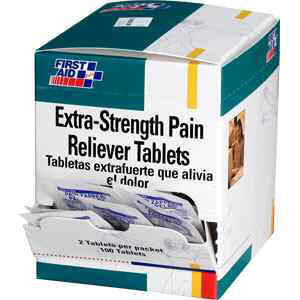 Boxes are also color-coded and perforated for easy identification and dispensing. Contents of each medication are listed in both English and Spanish, too. Active ingredients: Acetaminophen, 100 mg., Aspirin, 162 mg., Salicylamide, 152 mg., Caffeine, 32.4 mg.